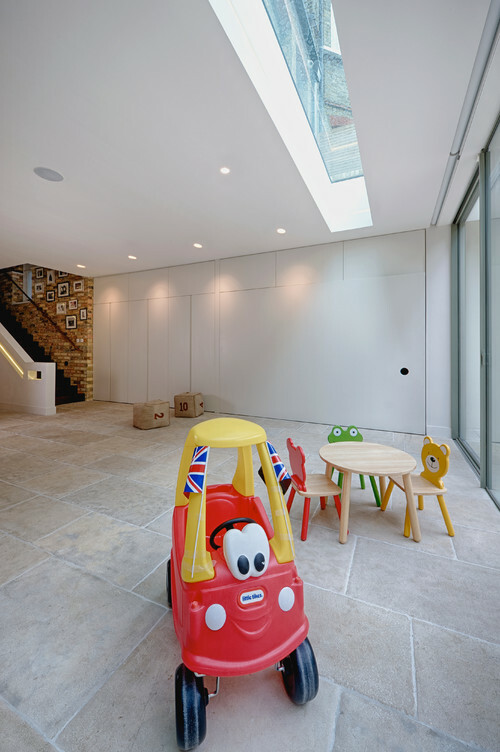 If you have children at home, you probably understand how important it can be to have a space that is dedicated to their activities. 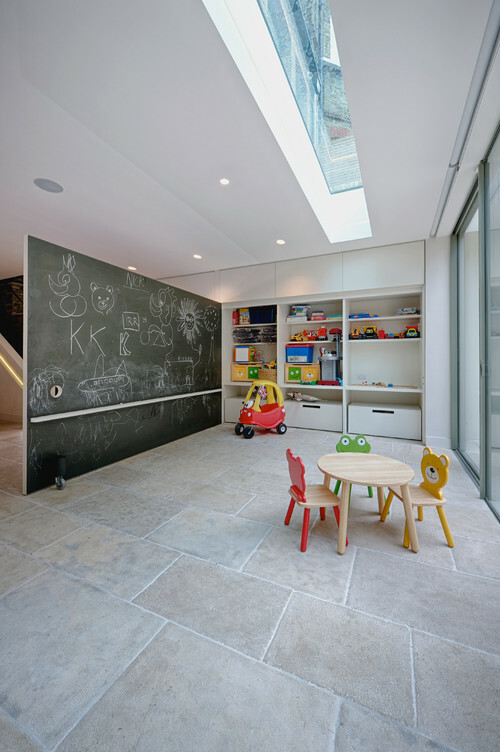 That may mean that you need anything from a playroom to a study space. With that in mind, I have put together some really cool kid’s spaces that may inspire you on how to incorporate their needs with your own. Having a study space (this could also be an art area) doesn’t have to mean disorganization. 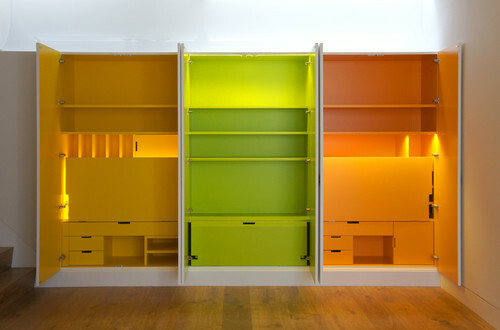 These cabinets open to create individual desk cubicles for each child. Then, close back up to hide everything away. 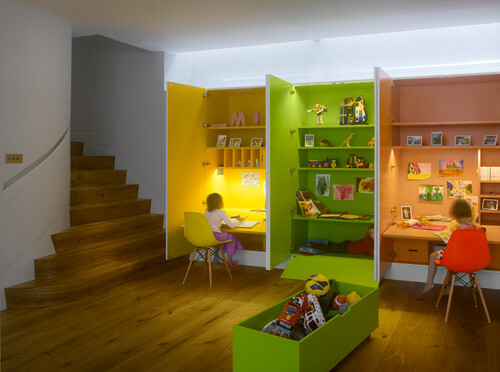 The bright and colorful interior allows each child to define their own space. While, the crisp white exterior maintains that grown-up look to blend with the decor. To get this look, convert a cabinet by adding desk storage cubbies and a fold down/pull out desk top. (the desk tops fold back up, or slide back, into the cabinet for a compacted unit). If you have an extra room, consider creating different activity areas. Here, the door into the room has been replaced with bars to give a faux jail cell. Next to that, a faux general store was added. In addition, a small table has been added to provide a place for crafts and art. 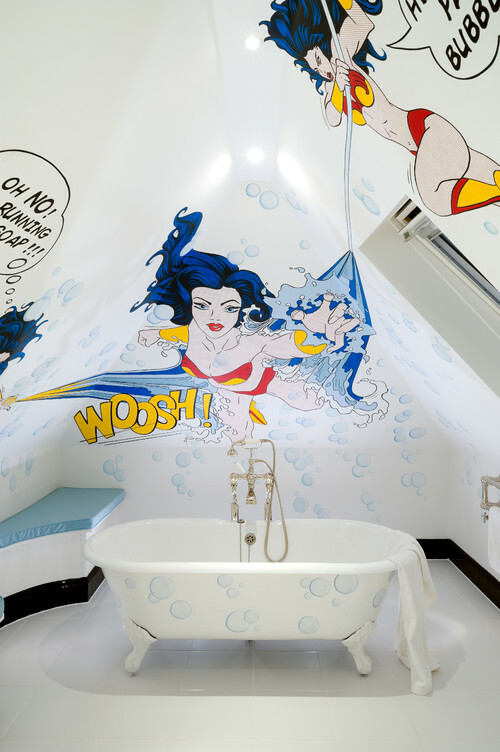 All of these items come together to create a space that allows imaginations to run wild. Reading nooks are always nice. However, if a window seat is not possible, consider something unique. 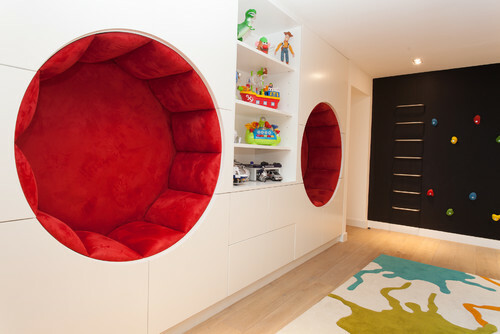 This home owner added some reading nooks recessed into this built in wall of cabinets. Because I love storage and organization ideas, I just couldn’t pass up these built ins. Each small drawer is labeled with the days of the week. This allows little ones feel a bit more independent without being required to make more grown up decisions. 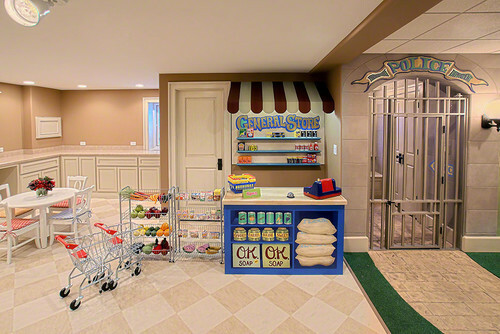 This is a nifty idea for converting a cool kid’s space quickly back to an adult room. Notice how the chalk board has wheels to allow it to roll around. Well, that chalkboard actually takes the place of cabinet doors. When pulled out, you have a play area. And when pushed back into the wall, everything is hidden away nice and neatly. What a great idea! A super easy, and very popular way of creating a private space for a child is to just add one of those teepees that everyone seems to be making right now. 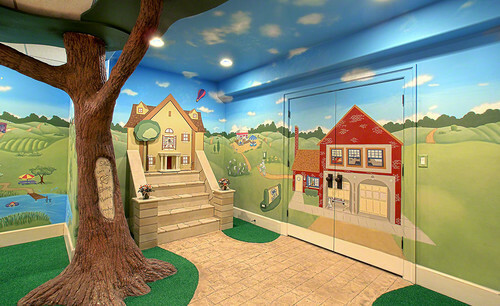 They can go in any room and offer a quiet space for kids to occupy themselves. This is another great idea to promote creative imagination. 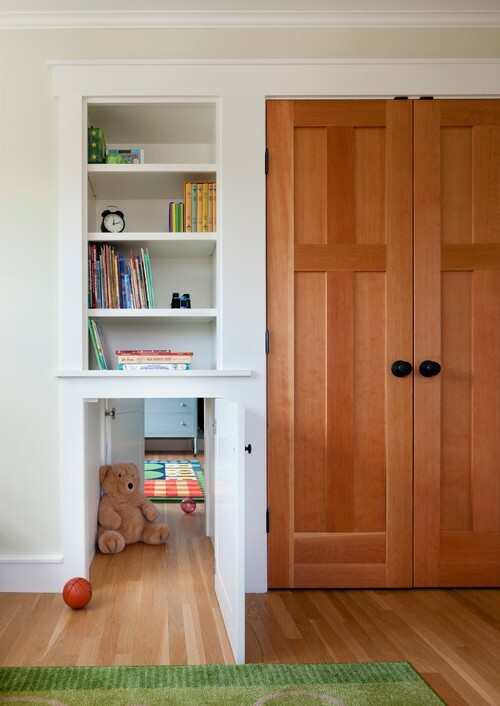 Recessed book shelves, in both children’s rooms, camouflage a hidden doorway that opens to a pass through. 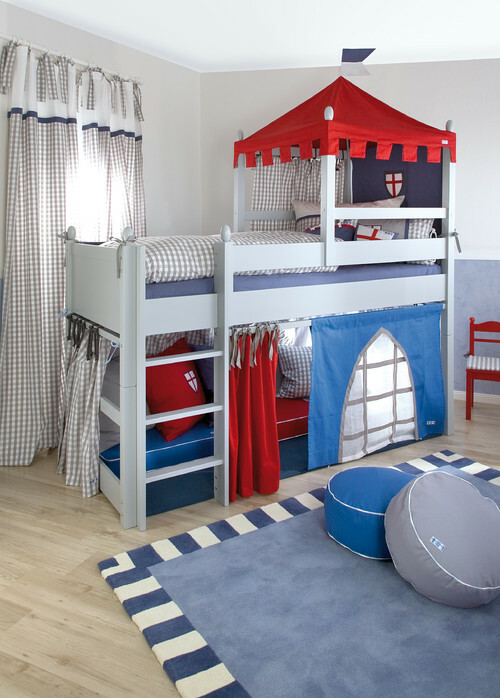 If space is too limited for you to be able to find a way to create a dedicated kid space, consider turning the beds into a get away. With some curtain rods and fabric, and a few additions made with some lumber, a bunk bed can make an incredibly cool kid’s space.